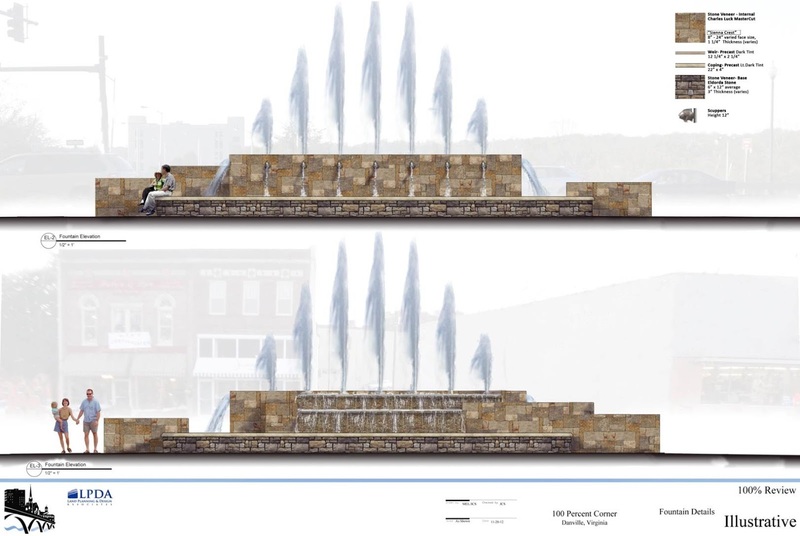 The fountain and plaza are part of the second phase of streetscape improvements in the River District. Construction began in April with the shift of downtown bridge traffic and installation of a storm drainage system. Since then, a pedestrian walkway with brick pavers has been put in place from Craghead Street and Memorial Drive to Bridge Street. The plaza’s most notable amenity, however, will be a multi-stage fountain that will be 40 feet in diameter. In the upper stage, seven water jets will shoot water vertically. The seven jets represent the Tobacco Warehouse District’s seven blocks, from the Carrington Pavilion to the new fountain. Below the jets will be scuppers that will allow the water to flow into the lower stage. Spills will be placed at each end. The fountain also will feature programmable color lighting. The fountain will be the focal point of the pedestrian plaza under construction in front of Lou’s Antiques, Jake’s on Main and Amburn & Co. Salon and Spa on Main. 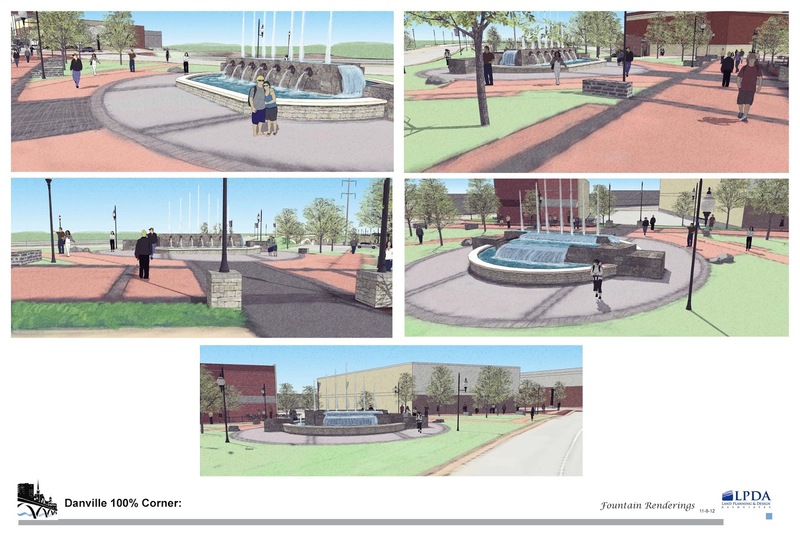 JTI donated the money to pay for the materials and construction of the fountain to symbolize the legacy of tobacco as an economic engine for Danville over a span of four centuries. JTI buys tobacco from farmers and processes it at its Danville facility. The company is a division of Japan Tobacco Inc., headquartered in Switzerland. Mayor Saunders thanks Steve Daniels on behalf of the City of Danville. The fountain is expected to be completed in about 4 months. The Downtown Danville Association welcomes three new officers and five new members to its board of directors, as a result of elections held at the recent annual meeting. Elected to fill the slots of president, vice president, and treasurer are Jeffrey Bond, Dewberry; Wendi Goods-Everson, Danville Regional Foundation; and Richard Phelps, National Guard. They join Corrie Teague of the Danville Office of Economic Development, who continues as secretary. The new officers replace Robert Brooks, Dale Hutchens and Peggy Wright.